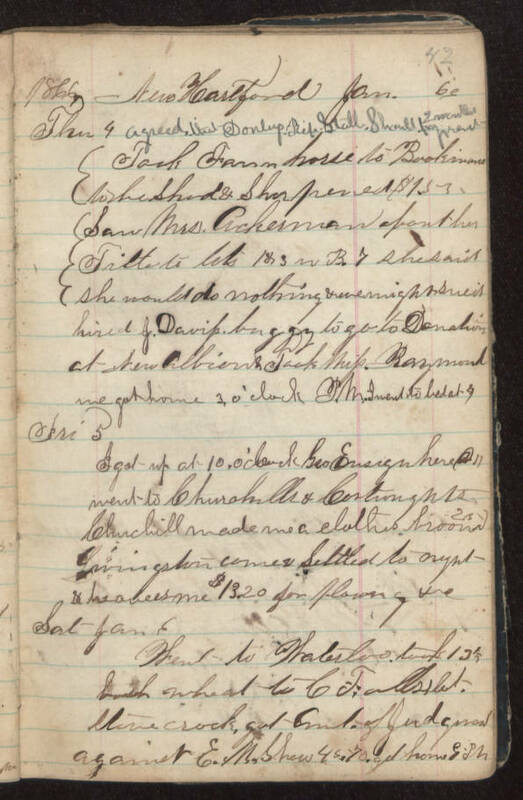 1866 New Hartford Jan Thu 4 agreed that DonleysMall.Shcmall Took Fann horse to Bookman's to be shod & Sharpened $1.53 Saw Mrs.Acherman about her Title to lots 1 & 3 in B.7 she said she would do nothing & we might sue'd hired J.Davis buggy go to Dention at New Albrons Took whip. Raymond we got home 3,0 clock. I went to bed at 4 Fri 5 I got up at 10 o'clock Geo Ensign here A.M. went to Churchills & Cartrights Churchill made me a clothes broom .25 Livingston come & settled to night & he owes me $13.20 for plowing &c. Sat Jan 6 head to Waterloo took 13 1/2 bush wheat to C. Falls, bot stove crock got amt of Judgment against E.M. Shaw 45.70 got home 9 P.M.